Like our last post this too is a collection of rather random sci-fi goodness but this one is from the 70s. I give a brief reflection on my thoughts after reading each story below. At 48 pages this one is a full-blown novella. At its heart, it is a story of class struggles in a future that has taken fashion to an amusing extreme. It’s a solid story and an easy read in an hour. At under 20 pages this brief foray into the genre is primarily psychological. In it a woman with a mental disorder is treated and we see the situation from inside the mind of the patient. The trip back to consciousness is illustrated as a journey on a mysterious floating island that has to be steered back to the mainland so the patient can rejoin the rest of society. In this brief story we have what I would categorize as an alternative history of sorts. Our protagonist, if he can be called such, has an Australopithecus as a servant and lectures his guests that a full third of history has been intentionally wiped from the collective recollection of society. This is a bizarre and rather surreal tale and one would not go amiss in noting that what it lacks in plot it makes up for in setting of the scene. Weighing in at under 20 pages this one reads like a twilight zone script. I will attempt not to spoil but know merely that it has a wry twist at the end. I cannot claim that it’s a terribly original twist but a twist none the less. In the story, man has bridged the gap between the stars but is still in the early, clumsy phase that requires him to sleep away the decades waiting. One such intrepid group has made the journey to Terra Nova and back again. How will they get on with the people of Earth who have passed decades while they slumbered? This is a story of a stark but fairly realistic future. Interestingly, I find that of all the stories in this collection, this one stuck with me the least. The only lasting impressions I have is of public executions and insane personal debt with the most notable item being a $4,000 personal computer from the J.C. Penney catalog. Of all the stories in this collection, this is probably my favorite. In a nutshell, aliens visit the Earth and they want to talk to the entity in charge. Which, it turns out, they believe to be the sun. The story goes into a fair amount of detail about how the aliens came to believe in the sentient nature of stars and points out effectively how our physical environment shapes our long-term mental framework about how the universe works. At the risk of somewhat of a spoiler I will reveal that the aliens evolved on a planet with an extremely elliptical orbit and large axial tilt so their seasons were acutely variable in temperature. At certain points when proximity to the sun coincided with the proper angle of inclination to the sun entire populations had to pick up and move to the other side of the planet. One wonders how early life could possibly evolve in such conditions but it does make one ponder the ramifications of such an arrangement. At any rate, as has been amply illustrated by my prolonged babbling, this one made an impression. In direct opposition to my feelings about the previous story, this one left me flat. Clearly some huge mental shift is taking place in humanity during the course of the story but it is intentionally kept vague and impenetrable to the point that I cannot muster any emotion from this story at all. And there you have it. Well, there I have it. I don’t honestly expect anyone to read these but some future version of me that’s trying to remember what that weird book was that had the story of the aliens that looked like the Apple logo. So hello, Future me! How’s it going? Did we ever figure out what that weird growth was in the corner of the back yard or did it take over the universe? As is so often the case I received this book from the author in exchange for a review. Despite that immense kindness I give my candid thoughts below. The book is a collection of easily digested vignettes featuring, unsurprisingly, the wives of those who serve our country every single day. Topics range from the joys of birth to the tragedy of death. Pretty much exactly what you would expect given the title. On the positive side, the book certainly does tug at your heartstrings. Though fictional, I suspect that much of what is written here is pulled directly or at least adapted from real life. The sacrifices that these women make every single day is not to be dismissed or forgotten and Rollins portrays their struggles in an emotional style that makes it simultaneously easy to read and hard to forget. To the negative, it is worth mentioning that the book is written from a heavily female point of view which makes it a sure winner with wives and mothers everywhere. That said, the male gender may have a bit of trouble empathizing because of this. That’s not to say that it’s impossible but potential gift givers should be aware of this possibility. Also, I found myself disappointed that the author had to ‘create’ these women rather than drawing more biographically on actual wives in the military. While I’m certain that the women in the stories represent their demographic wonderfully, something is always lost from the fictionalization of a story that could be just as well done and probably contain much of the same content when you can say that this person actually does exist. Readers love to imagine that the characters they’re reading about are real people and this book just barely misses that mark. 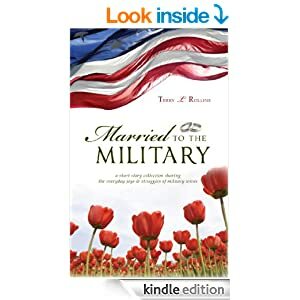 In summary, this book is an obvious choice for any woman and particularly one who has some connection with the U.S. military or, honestly, any military in the world. Men will have less of a connection to it but it might help them see more clearly just what the struggles are that their wives go through every day. This book came to be via the Kindle Buffet as I was browsing about for something to read on vacation. Since I actually paid $1.99 for this book for a change, I’m exceptionally motivated to be honest about it. Generally I like to frame my reviews as positives, negatives and summary. Occasionally, I come upon a book that breaks this mold because I can’t find an appropriate comment for some section. In this case I can’t really find anything negative to say about this book. The author is an obvious talent. He can craft sentences into the most twistedly entertaining prose I’ve seen in a long time. His talent for coining words baffles the dictionary and forces the reader to stop and think about what they’re reading. Horvath’s verbiage is high art. As accompaniment, his content is delightfully surreal. Through all his stories there is a common thread of “What in the …?” that pleases in the same way that Dali’s melted clocks, though nonsensical on the surface, display a deeper and more significant undercurrent of importance. In summary, well worth the investment of a few dollars. While the purchase should not be questioned, however, the environment of consumption should be carefully considered. This is not one to be read while the kids play frantically in a maelstrom of manic energy. Understories is best left for a quiet contemplative environment in which it can be completely and fully appreciated. Give this one some space in your brain and you shall not be disappointed.